There’s nothing quite like making a house feel like home, but sometimes, it’s hard to find a starting point. At Lott Furniture Co., we are here to bring you home, and we’ve been doing just that since 1917. After two events, we are happy to announce that Wine & Design is here to stay! In case you’ve missed it, we’ve started an after-hours event recurring the second week of each month. We have intentions to bring more people Downtown after 5 o’clock, and encourage our friends and neighbors to attend other events with our fellow merchants as well. Most importantly, snacks and complimentary WINE! We have a featured guest each month (sometimes two!) with experience and expertise with interior design, seasonal treats, wine, and plenty of fun people to hang out and discuss design with! 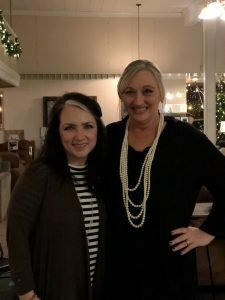 We had so much fun at Wine & Design this month, we wanted to share a few tips we learned for all you people who missed out! 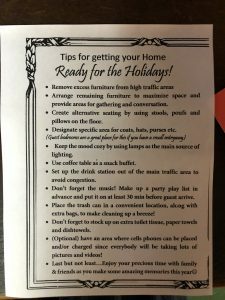 Ammie West, Laurel native, came and prepped us for extra holiday guests, and Teresa Ishee (Ellisville) showed us just how easy it is to set a beautiful and functional Thanksgiving table! “Create alternative seating by using stools, poufs, and pillows on the floor.” Ammie suggested using your coffee table surrounded with pillows or footstools as your kids table! She even unrolled a roll of kraft paper to place on the top for kids to color on when bored. Also: it protects the table from a mess! “Use the coffee table as a snack buffet.” Don’t underestimate the uses of a coffee table! Ammie suggested setting up your hors d’oeuvres, desserts, and snacks there. She also mentioned using a desk or dresser base as your buffet! “Have an area where cells phones can be placed and/or charged since everybody will be taking lots of pictures and videos!” We love this so much. This is a perfect idea! A great touch is to add some fresh greenery or florals. 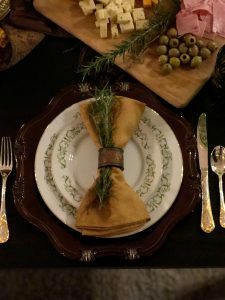 For this example, she cut some fresh rosemary springs to decorate with and to place in her napkin holders. The fresh smell was the perfect touch! On days like those, when she is struck with the fire of inspiration, Teresa is an unstoppable whirlwind of productivity. She suddenly has the strength and dexterity to lift a recliner and carry it from room-to-room. She is more than capable of shoving an overstuffed couch from one end of the living room to the other three or four times without breaking a sweat. I usually sit back and watch, afraid to touch the ferociously spinning ceiling fan blade that is my mother when she’s ready to “rearrange,” as she calls it. (I’ve always thought it funny that she usessuch a simple word to describe such a complex process.) 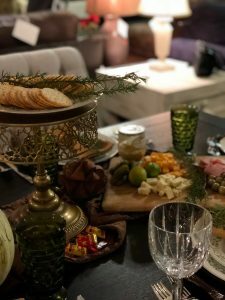 However, since Mother has begun putting her personal style and technique into words at Wine and Design, I have begun to consider why exactly my mother is so often altering the chemistry of our home. Is it a chemical or physical change? What does the change do? Why does she enjoy it? Why does the house always seem a little better afterwards, even if the couch is now turned away from the TV or the coffee table is in just the right spot to always ram your knee into it as you stand up from the recliner? I think I have it figured out. Our home is a metaphor for our lives. As our family grows and changes, so to does our house. A baby is born, so the living room is rearranged so that we all fit around the recliner where, inevitably, the mother will sit with her new baby as everyone takes turns poking at it and pointing out how much he or she looks like an Ishee. Someone’s birthday comes along, and the breakfast table is suddenly much larger and crammed with chairs to accommodate all the Ishees, hungrier for conversation with one another than for whatever meal the birthday boy or girl has picked. (This could be a stretch in our house, but I’ll take an artistic risk.) Our house and its contents are ever-changing, just like my mother’s tastes, and the moods and needs of those who live inside it. As I sit and listen to my mother explain how to set a table to fit as many people as possible, I become suddenly and powerfully aware that a house can be a reflection of someone’s tastes. It can be beautiful and reasonably functional, but if it’s a place that’s cozy and comfortable, a place you can’t wait to get back to after a long vacation, that is thanks entirely to the home being a reflection of the family who resides within it. In our case, this means that our house must be, to use Teresa’s terminology, “rearranged,” as often as is necessary to keep up with the rearrangement of our family. 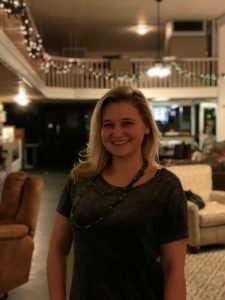 -Jana Ishee, daughter of Teresa Ishee, attendee of Wine & Design, and friend to Lott Furniture Co.
What we gathered from both of our wonderful guests is that: Home is personal. What you think is homey may not translate to someone else. But we can agree on is that functional pieces are always going to be the most useful to you. When picking something pretty, think: How can I think outside of the box and use that? What we are so thankful for this Thanksgiving is our customers and friends. Thank you so much for making our lives so busy and so fulfilled. There is nothing we enjoy more than bringing you home. We hope to see you at our next Wine & Design on Thursday, December 14 from 6 PM- 7:30 PM. We will have another special guest that we can’t wait to announce, and live entertainment from Nashville artist, Anna Morgan Michel. Be sure to check out our first Concept & Craft blog, and watch closely for a new one! We post unique finds, and interior design tips and tricks in the series! Watch our social media closely for updates on our next Christmas Wine & Design, and sign up in the gold box for email updates every time we post!